Every once in a while, we like to introduce our students, and ask their advice for future students coming to Lexis. 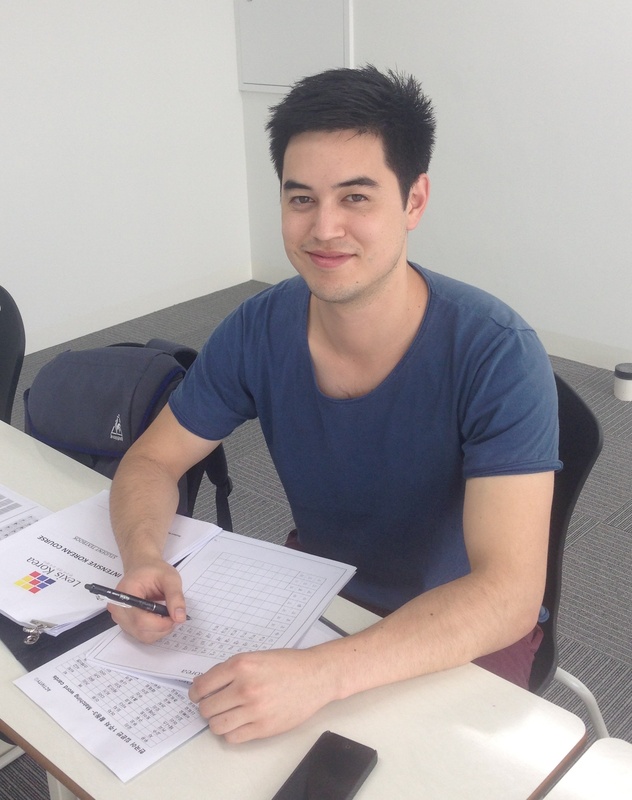 So……..meet Nicholas, from Melbourne, Australia! Basically, I heard Big Bang and I got interested. But more than that, I have a sense that things are really happening in Korea. I spent some time on YouTube to learn some more about the culture. And Korean women have a reputation for being very pretty!! I had a funny reaction when I told me friends I was coming to Korea. All my Western friends kind of asked “Why?”. All my Chinese friends, especially the girls, would say “I know why you’re going” straight away! And how’s that going for you? What were your first impressions of Seoul? The culture’s so different from anything else, that’s what I’ve found. There’s a bit of chaos here. It’s really, really busy. I found it a very intimidating city when I first got here. I came to a hostel in Hongdae pretty late at night, maybe 9pm. When I got in from the train station, it was packed! That’s like rush hour in Hongdae – I couldn’t see any street signs, there were just too many people around….and I was the only guy going through with a case. So first impressions? Seoul is really, really, really overpopulated. It took me a few days to adjust to how busy it was, but then I realised later that Hongdae at night is a special place and the rest of the city is not so bad! And a couple of days in? I think after a couple of days, I really started to enjoy it. I’ve been here a week now. I found one thing I had to adjust to is that at first, I felt that Koreans were insanely rude, but it’s not that, it’s just that people really mind their own space. People are really in their own world. Where are you living, and how is it? I’m living in Corelivingtel, ‘Good Morning House’ at Yeoksam Station. The host is Yu – he’s very nice, very helpful. He was great for check in and explaining all the quirks of living in a Korean apartment – the number combination doors, and to make sure you sort your rubbish appropriately, and basically how to use the facilities. The room’s really small. From Australia, it’s a bit of a shock at first. One thing is that you have to keep the room very clean when it’s so small! Have you raided the free rice, noodles and kimchi? Not yet. I should take advantage. Asuka (classmate) is doing pretty well on the kimchi! You’re three days into your Korean program. How’s it going? Really well. I’m actually very impressed with the class. I was self teaching for about a year, and I think in three days we’ve pretty much covered everything I was trying to teach myself in all that time! It’s very fast, and they explain a lot of the key things you need to get right from the beginning. The course material is great. I was happy to do some pre-study, but when I see how quickly everyone else is catching up…it’s crazy. I can’t even imagine where I’m going to be in a month’s time. So, what’s good for lunch? The chicken place across the road, with the red sign. They have a buffet for about 5000 won, with sandwiches, stews and everything. Upstairs is good, too. I’ve had the bulgogi and bibimbap there. What advice would you have for someone who’s coming here? Coming to the school solved a lot of my problems – Sunny took me out straight away to get a mobile phone and things like that. The school can sort you out. Coming here for the first time, it’s hard to figure things out by yourself, so it’s great to be able to ask the school for help.